Enjoy your sweet baby time…it’s so short! It’s always good to know your priorities. Best of luck! Hi Anna. I’m one of the “newcomers” to your blog. 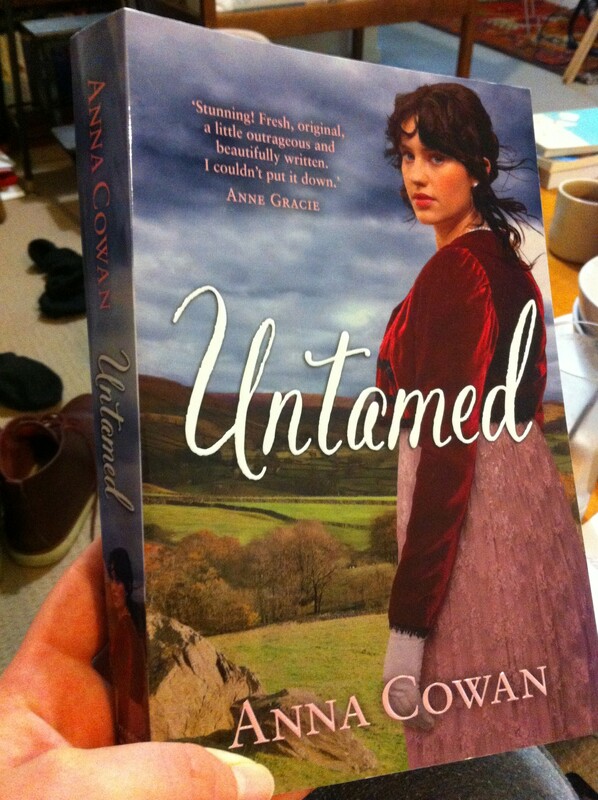 I stumbled across a review for “Untamed” a few days ago and since then have been reading your blog/posts with great interest and enjoyment. Plus: I’ve had the first Lymond book gathering dust on my bookshelf for years: thanks to you and Cat, it’s getting bumped right to the top of my reading list. Best of luck with motherhood! Have a wonderful babymoon! I hope all goes wonderfully! Don’t worry about us. We’ll keep the place swept and tidy, and we’ll be waiting patiently. This is a big, huge, massive year for you…enjoy every second! I first “met” you when you interviewed on History Hoydens and downloaded Untamed at that time. I finally read it yesterday, and I stopped by to say that it is without doubt one of the best romances I have ever read. Your prose reminds me of Barbara Kingsolver and Carlos Zafon (both wordsmiths), and I bookmarked several of your inventive, descriptive and beautiful sentences. I am happy to learn that you are “in anticipation of a happy event” as the Regency folks would say. Wishing you all of the best for a healthy baby. Untamed is the first het romance I’ve touched in years, because at one time I was just so fed up with the ‘gorgeous’, testosterone-oozing hunks and the ‘spirited’ (but slightly dumb) women, that I started to read m/m exclusively, a long time ago. To be honest, I only picked this one up, because it was recommended by C.S. Pacat, and I trust her taste. I’m only halfway through but I must say, I absolutely adore your characters! They are both very capable in their own way, and neither of them is dumbed down to make the other look better. They have weaknesses and vulnerabilities without coming across as pathetic. And I especially love that they are NOT all over each other from the get-go because they just ‘can’t contain themselves’ in their desire for each other, or whatever. You have managed to write the first het romance I’ve read without cringing and the feeling of enjoying a guilty pleasure. Thank you so much for this! I can’t wait for your book to be translated into German, because I know some people I would like to recommend or gift it to. More books like this would be welcome, as well, but for now I hope you’re enjoying your baby break and the upcoming christmas time.